Energy Star has been around long enough that it is now possible to buy very efficient appliances on the used market. Craigslist is an amazing marketplace for this. It takes a lot of vigilance, but eventually many good deals can be found. Most people are very reasonable about their asking prices–sometimes if they seem a bit high, they are willing to take a lower offer. I like to think I am fair minded and not seeking to rip people off or take advantage of their need to sell, so I often pay the asking price for whatever offers I find desirable. Although there is some evidence that bottom freezer refrigerators can use less electricity per cubic foot than top freezers, in general top freezer models are the most efficient. 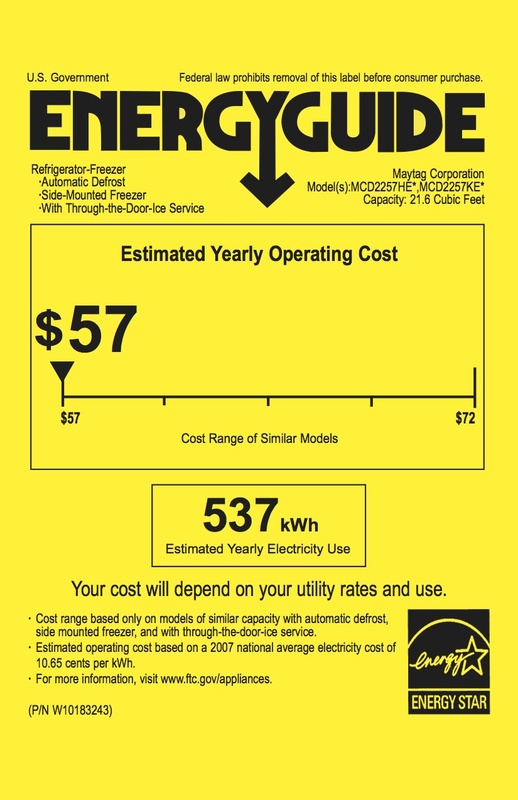 In Arizona we had a Maytag energy star side by side and the estimated yearly electricity use was 537 KW for a 21.6 cubic foot model. This smaller top freezer model will use only 378 KW per year–about 150 KW less per year or $17 less per day in about 4 fewer cubic feet. We liked having the nifty water and ice in the door, but they are energy users. Simpler and less expensive is a LEED kind of decision too. Will have to hook up the ice maker to be sure it works. I have the piping just need to connect it. Notice the layout of the shelves on the door. 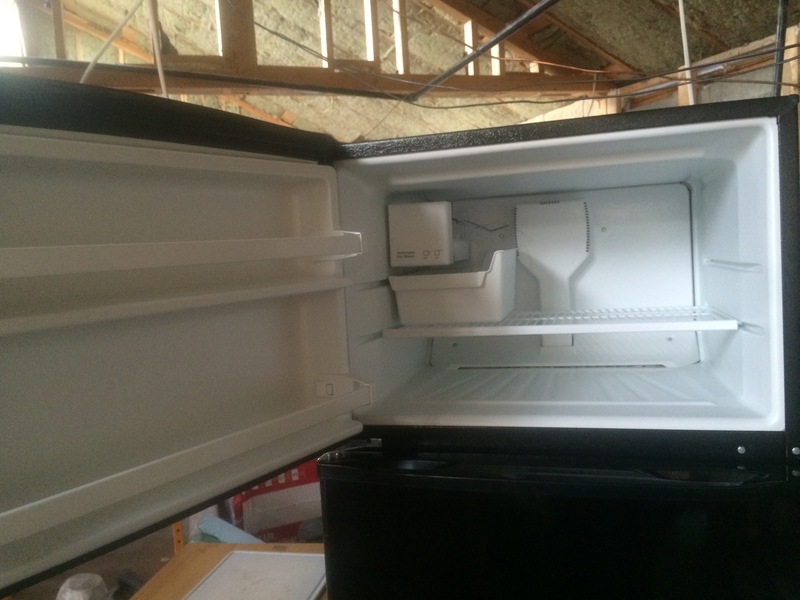 This layout is the key to finding the actual model of this refrigerator. There are some broken plastic door shelves. Our Maytag had the same issue. These can be replaced but a little duct tape seems to handle the problem too. The ventilation grill is in the rear so a bit harder to keep clean, the actual coils are hidden underneath. Rear ventilation grill and ice maker line. 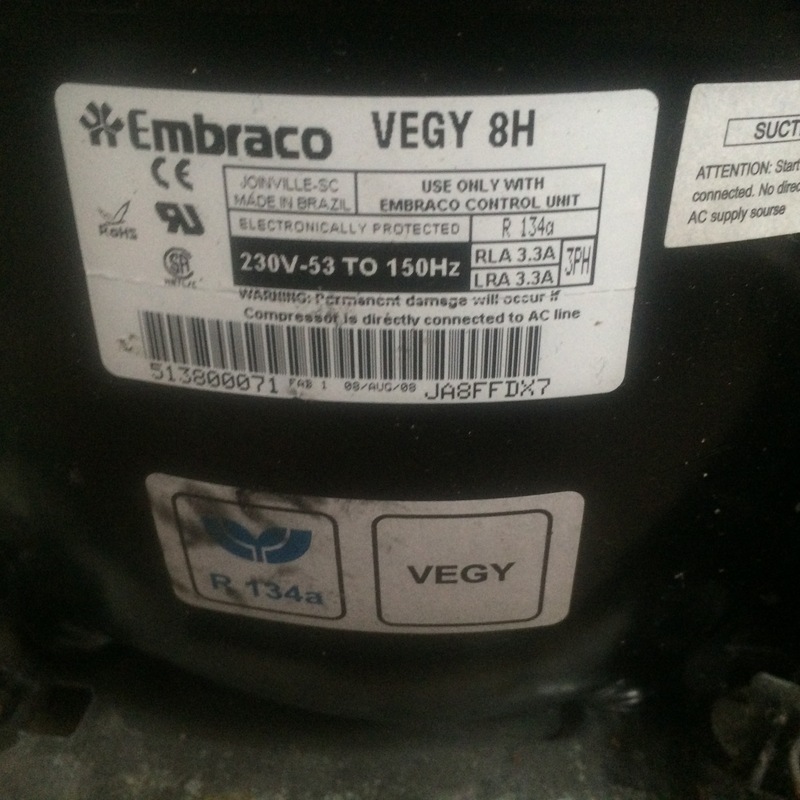 The compressor is a VEG model that the Embraco website claims is 40% more efficient that similar models. The R134a refrigerant is of course not climate friendly being a hydrochlorofluorocarbon (HCFC). It replaced R22 and R12 which had a higher environmental impact (Ozone depleting Chlorofluorocarbons or CFCs) but work is being done to reduce or eliminate the use of global warming gases in refrigeration. Hydrocarbon refrigerants are used in most of the world but in the US they are slow to be approved due to their explosive nature. Our RV refrigerator uses Ammonia which is considered environmentally friendly and in 2014-2015 domestic hydrocarbon based refrigerators may be available. This sizing label is all the information that I could find on the refrigerator though. The model and serial number sticker is missing! The seller said it was a “only a couple” of years old. So I had to do a bit of research to find the approximate year of manufacture and actual model. The W8RXNGMW model matches these specs and was manufactured from 2009 to 2013. The W8RXEGMW model is identical except for qualifying for Energy Star and was made from 2010 to 2013. Whirlpool kindly posts all its product catalogs for these years so I hoped to find the same configuration of size and shelving to find the model number. I had assumed that the fridge was the Energy Star model but was confused by the lack of a model number in the unit itself. The 2009 model catalog lists the sizes and shelving units in text. Only the W8RXNGMW model matching our fridge was made that year and it was not an Energy Star model. 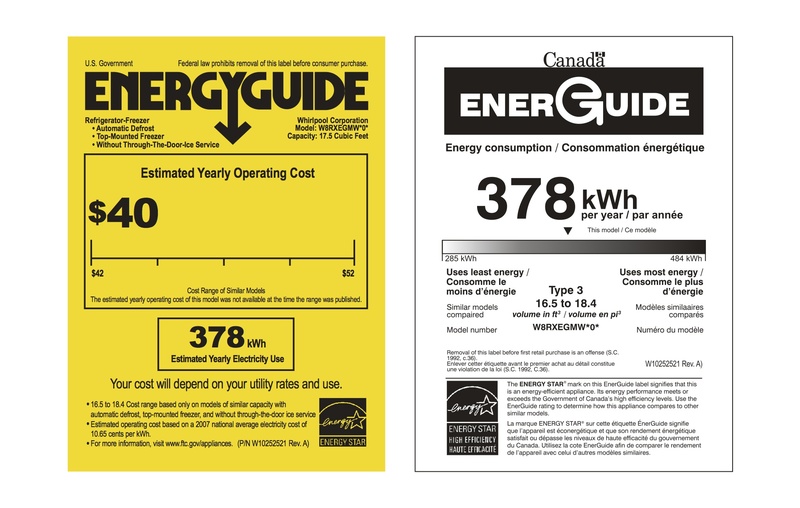 The 2010 catalog includes the W8RXEGMW Energy Star qualifying model with text descriptions, but the 2011 catalog shows photos of the interiors of both models. Here is where the door configuration is obviously different for the Energy Star model and matches ours. The part numbers for the W8RXEGMW match our refrigerator while the parts for W8RXNGMW do not. The 2012 catalog shows the same model but by 2013 this model is no longer featured with a photo although it is listed in the specs. Conclusion: the research points to a 2011 or 2012 (even 2013 but that is unlikely) Energy Star refrigerator. This entry was posted in Appliances, Energy Efficiency, Reduce Reuse Recycle. Bookmark the permalink.